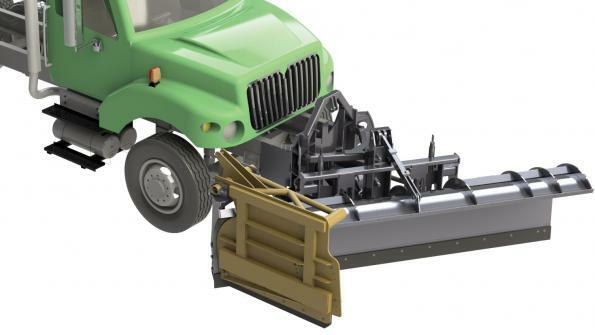 Henke’s Snow-Gate for trucks gives the operator the control needed to keep driveways, streets and intersections free of snow, resulting in fewer calls for re-plowing. The Snow-Gate allows drivers to get up next to the curb, and is engineered to fit the contour of the moldboard. The unit features up, middle and down positions. It is designed for Class-8 trucks. The assembly requires hydraulic function to operate a 3- by 10-inch, 1¾-inch double-acting hydraulic cylinder. It offers fast and responsive hydraulic action. Dimensions are approx. 55 inches long by 48 inches tall. It also features a floating “Road Contact Strip” with continuous spring down-pressure. The unit fits directly next to curb for precise snow removal. The product weighs approximately 900 pounds. The product is available for new plow orders only. Leavenworth, Kan.-based Henke Manufacturing produces snow and ice removal equipment. The firm has over 100 years experience in the design and manufacture of snow fighting equipment used in both the public and private sectors. The video shows how the Snow-Gate works.